Immunogen: Synthetic peptide corresponding to the sequence near the N-terminus of rat PGF2 Receptor. Crossreactivity: Predicted species reactivity based on epitope sequence homology: wild boar, dog. 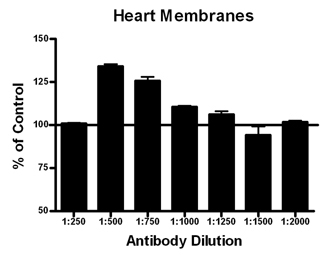 Predicted MW of ~41kDa, observed by Western blot ~45kDa. Higher MW species (~60kDa) and intermediates also observed by Western blot which reflect post-translational modification of the receptor. Scientific Background: Arachidonic acid is converted by cyclooxygenase (COX) to prostaglandin H2 (PGH2), which is further converted to the derivative prostanoids PGD2, PGE2, PGF2α, PGI2 (prostacyclin) and thromboxane A2 (TXA2). Five classes of prostanoid receptors are recognized and named DP, EP, FP, IP and TP receptors corresponding to the agonist properties of the associated prostanoids. FP receptors are found in smooth muscle where they mediate contraction, and are believed to be coupled via Gq/11 subunits to stimulate phosphatidyl inositol (PI) hydrolysis. The FP agonist Fluprostenol (a PGF2α analogue) is used in animal husbandry to synchronize oestrus and induce partruition. FP receptors are known to mediate intraocular pressure, and FP agonists such as latanoprost and travoprost are drugs commonly use to treat glaucoma. 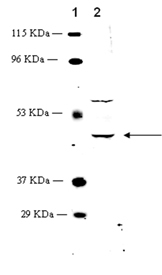 Western blot analysis of MW marker (1) and 25µg rat kidney extract (2), probed with PGF2α Receptor (FP) pAb. Membrane ELISA: Lewis rat striatum membranes (5µg/well) were treated with 1 μM concentrations of agonist (cyclosin) and probed with PGF2α Receptor (FP) pAb (1:250 to 1:2000 of a 1µg/μl stock solution) by ELISA. Data from vehicle treated cells were taken as 100%. Results are the mean ± SEM (n=4).